Former Philadelphia Eagles running back LeSean McCoy, left, will not face charges for his involvement in a Feb. 7 nightclub brawl in Old City that injured two off-duty Philadelphia police officers. The state attorney general's office said it will not overturn the decision by Philadelphia District Attorney Seth Williams, right, not to prosecute McCoy. LeSean “Shady” McCoy has officially beaten the rap for a Feb. 7 bar fight at the Recess Lounge that resulted in two off-duty police officers being seriously injured. The state attorney general’s office has formally notified John McNesby, president of the Fraternal Order of Police in Philadelphia, that it will not overturn a decision by District Attorney Seth Williams not to prosecute the former Eagles star running back. At his May press conference, Williams. stated that one of the off-duty officers at the Recess Lounge was the aggressor. Officer Roland Butler, the district attorney said, grabbed one of Shady’s companions, former Pitt running back Tamarcus Porter, by the collar, and then by the throat. Both men wound up on the ground where witnesses saw Butler on top of Porter, Williams told reporters. At 6-foot-4 and at least 250 pounds, Butler had a decided advantage over the 6-foot-1, 195-pound Porter. When bouncers threw Butler out of the Recess Lounge, along with Porter and Officer Darnell Jessie, another off-duty cop, the district attorney said, two on-duty Philadelphia police officers were standing outside the club. And they saw that Butler was "the person being the most aggressive,” Williams said. "I want the guy with the dreads, I want the guy with the dreads" is what witnesses supposedly overheard Butler saying about his desire to get even with Porter. Witnesses told investigators that the incident began when Butler allegedly swiped a $350 bottle of pink champagne off McCoy's table. There were other problems with the case that prevented the district attorney from prosecuting anybody. No two witnesses could agree on what happened, he said. And the two officers didn’t follow police procedures such as calling 911 after the fight, the department's policy when they're involved in an off-duty incident. Instead, Butler left the scene and sought treatment at Delaware County Memorial Hospital in Upper Darby for a laceration to his right eye, a broken nose, broken ribs and a sprained thumb. The other off-duty officer injured in the brawl, Jessie, was admitted to Hahnemann University Hospital, where he received eight stitches over his left eye and treatment for a possible skull fracture. In an April 4 letter to the attorney general’s office, McNesby described the district attorney's decision not to prosecute as "an outrageous cover-up and dereliction of duty by a public official." McNesby stated in his letter that the only reason Williams let McCoy off the hook was "because McCoy is a prominent professional athlete." In February, McNesby and Philadelphia Mayor Jim Kenney, after seeing a 30-second cellphone video posted on TMZ Sports, had called for the arrest of McCoy. In the video, the officials alleged, McCoy was seen throwing a punch. His lawyer, however, said that if McCoy threw a punch, he whiffed, and that the only thing he was trying to do was to pull Butler off of his friend, whom Butler had pinned on the ground by the neck. The stakes were high for McCoy. Had he been suspended from the NFL for even one game, he would have risked losing $18 million in guaranteed money in the $40 million contract that he signed last year with the Buffalo Bills, after he was traded from the Eagles. 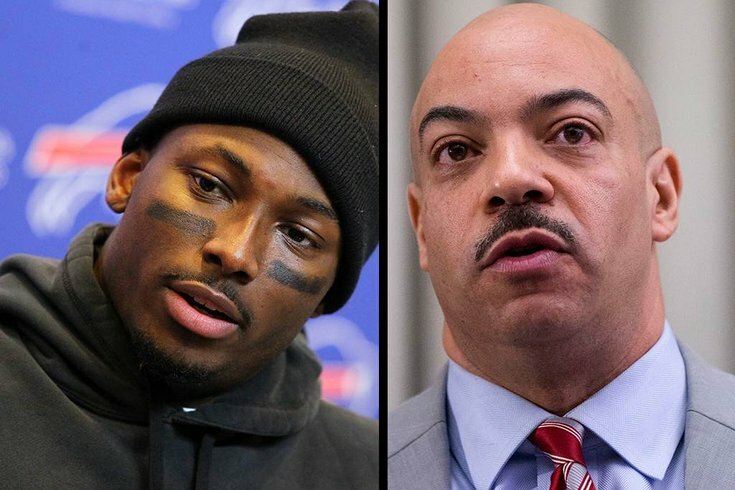 "The Philadelphia District Attorney's Office was pleased to learn that the Pennsylvania Attorney General's Office, after their review of the LeSean McCoy case, declined to seek permission to overturn our decision not to prosecute. This was a decision that should be left to locally elected officials, and it is appropriate that the Attorney General will not try to intervene. As always, the District Attorney had no motive in reaching his charging decision other than making the call on the facts of the individual case."